All South African George V are very scarce at the MS-66 grade. Only 8 coins out of 2425 have achieved this technical grade at NGC. Only 21 coins out of 5014 have achieved the MS-66 grade at the combined PCGS and NGC Population out of all South Africa Gold Sovereigns! Have a look at a snapshot of the Population Census at NGC as of 9/16/2018 for all Pretoria Mint Sovereigns. 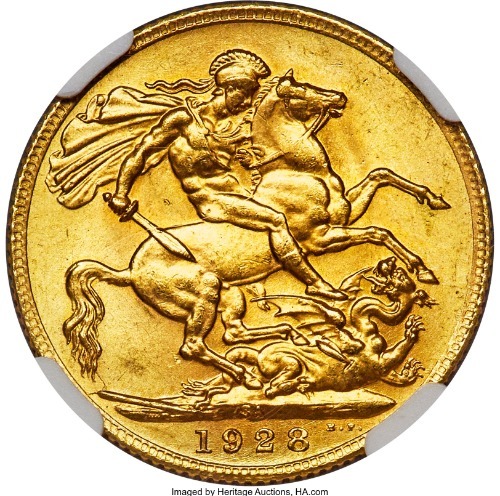 From 2425 graded Gold Sovereigns only a total of 11 coins have been graded MS65+ or better. This makes the coin on offer better than the 99.5% of the coins offered for the Series. A similar situation can be found at the PCGS Population Report for the Series.